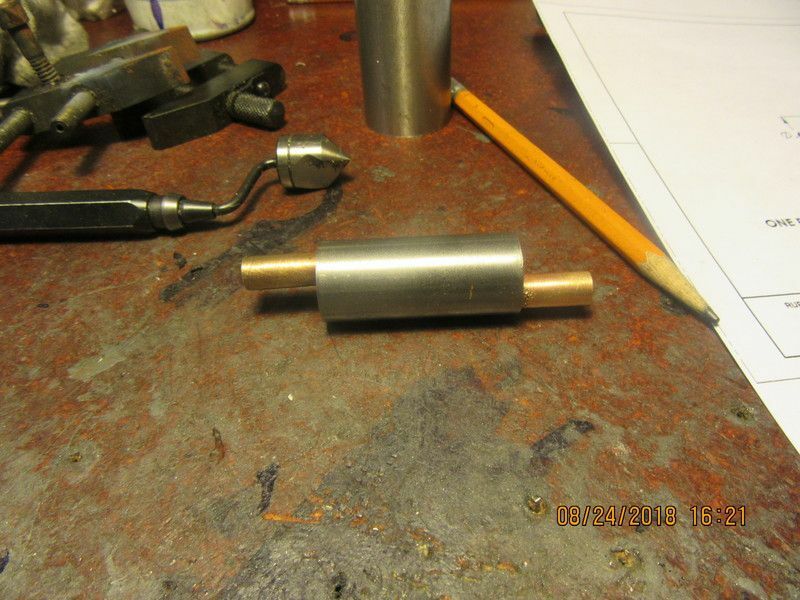 Just for the heck of it---has anyone ever built a muffler for a model i.c. engine? I have designed one this morning, based mainly on guess-work and size constraints. This muffler is designed to fit onto my flathead single cylinder engine which I designed and built a few years ago. This engine currently has a "straight pipe" on it, although the straight pipe has some fancy carving on the outside of it. Since I don't have a decibel meter, I will have to post a video showing the engine running in its current configuration, and a second video with the muffler installed on it. 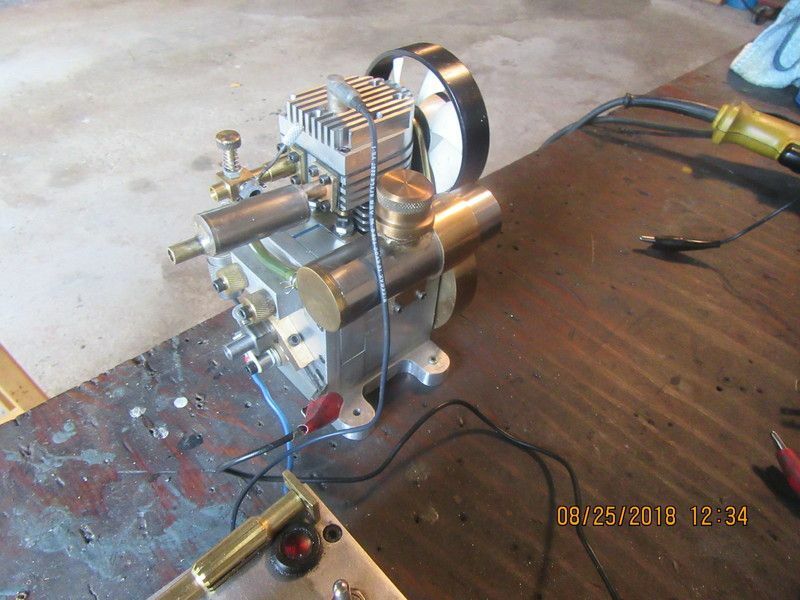 This picture shows the flathead engine in its current configuration.--The exhaust is really just a straight pipe, in spite of the fancy carving on the outside of it. 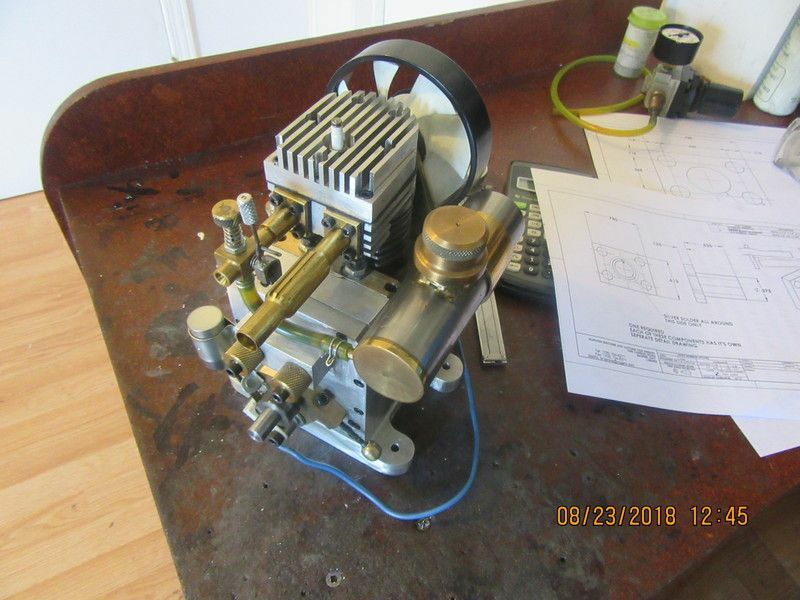 Brian, I made one out of stainless to scale for the Briggs & Stratton engine. As I recall you have a digital copy of the plans so you can check that one out. It was made according to the B&S muffler just at half scale. Being stainless it should last forever. If you cant find it let me know and I will post that page of the plans here. I made one for my horizontal engine. Like you I don't know really how effective it is but here's the plan and some pictures. Brian, if you have a smartphone, you should be able to fine a decibel meter app for it. Probably now quite as accurate as a dedicated meter, but close enough for this purpose. Just a thought. I don't have a cell phone nor a smart phone. The smartest thing here is me.--and that's pretty scary!!! This video shows my small flathead engine running, so you can hear the current noise level. Really, it isn't that loud even with a straight pipe on it. One thing I have to be careful of.-I mix a bit of 2 cycle oil with my gasoline, for the sake of my Viton o-ring on the piston. None of my small engines run hot enough to burn this oil, so there is a steady fog of oil mist coming out the exhaust. I have to arrange things so there is not an oil trap built into the muffler. Brian, nice looking engine, and nice running too. Currently, I'm building a Tank Mogul, one of Bob Bromps's old engine kits. At any rate, I wave always wanted an engine with a pot muffler. So I went and designed one, and made a pattern. Note, this is only the pattern, I need to make the castings yet. That is going to be a good looking pot muffler Maury! Is that a freelance design or did did you find a picture somewhere? Brian Asked if anyone had ever built a muffler? I think most anyone who has built a scale model of a real engine has probably built a muffler for it. Here is one of mine; http://www.modelenginemaker.com/index.php/topic,1326.490.html starting at post #497. Thanks for the nice comments Brian. I guess the sad thing is...my first understanding of a muffler was a piece of woman's clothing. It was later that I understood the term also meant some hard, cold, object meant to suppress noise. Something that you didn't want to remove in order to avoid the law. I still prefer my initial thinking...something soft and warm that you wanted/tried to remove, regardless that it might involve the parents (the real/only law at the time). I have drilled a small hole in the bottom of mine to avoid this problem. I did quite a lot of work on silencers (as we call 'em over here) back in my aeromodelling days because we needed effective silencers to stop losing flying sites. From my work on this I established some basic principles. 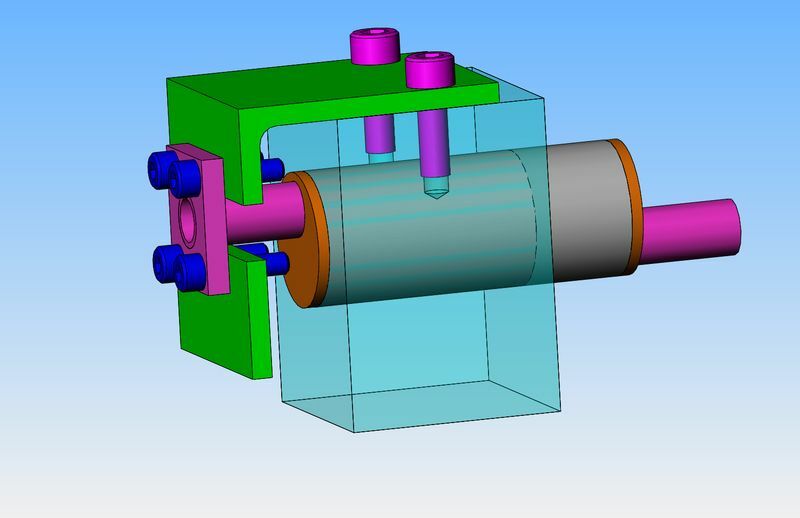 The initial chamber of the silencer needs to be quite large (say >5 times the swept volume of the cylinder) and made of something rigid. The large space allows the exhaust gas to expand into the chamber which cools it, and that reduces the pressure (and thus the magnitude of the pressure pulses). 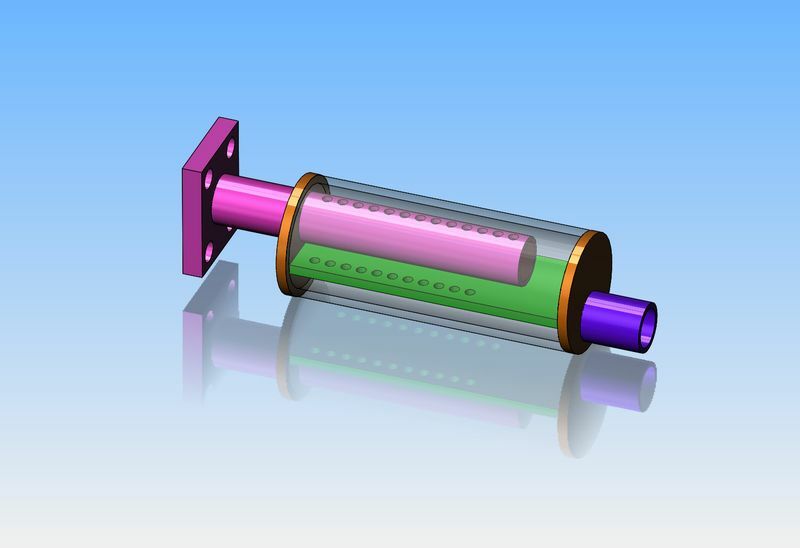 The chamber needs to be rigid so that the pressure pulses don't just get transmitted through the walls, so a good solid thick-wall casting or machined lump. After the initial expansion chamber you need to feed the gases into a second chamber that is at least five times the volume of the first one for further expmasion and cooling. This second chamber needs to have some sound-attenuating blanket around it to (again) stop the noise being directly transmitted through the walls. But whatever you use for this blanket mustn't thermally insulate the chamber because that negates its whole function (cooling the gases to reduce their pressure). Irvine came up with a superb and really effective solution to this problem with their "Q-type" silencers and "mouse" after-silencers where they used the cooled exhaust gas itself as the sound-attenuating blanket. If you don't have one to hand to cut up then let me know and I'll post a sketch of the concept. 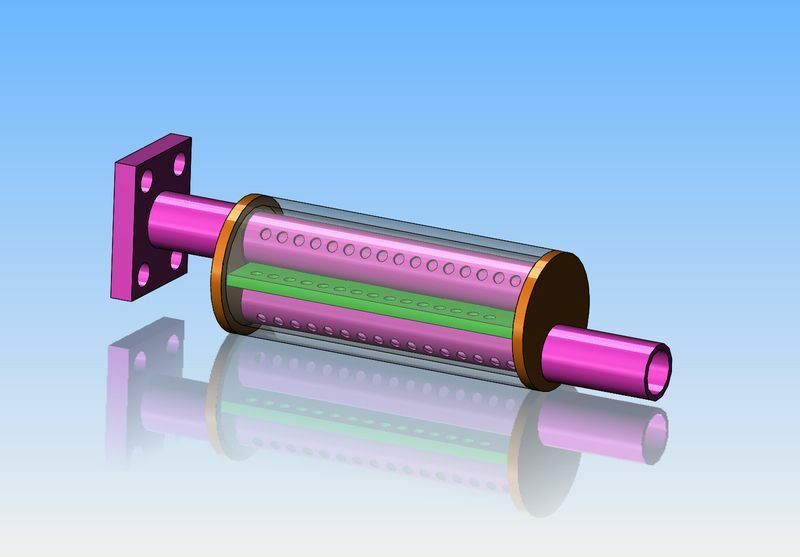 Finally you need an exhaust pipe that is large enough to allow the pressure to drop, but small enough to present a reflection to pulsed pressure (this gets technical if you want to calculate it, but just experimenting with oriface sizes can find the answers quite quickly). I found that the automotive approach of having a final chamber filled with some sort of sound adsrober (steel wool, glass wool etc) doesn't scale down - it just created backpressure in model sizes, causing the expansion chambers to stay hot and destroying their function. Using these approaches it was possible to get a 6.5cc 2-stroke to chuck out over 1.2bhp at 11,000rpm with a peak noise output of 77dBA @7m from the back. At this point there was as much noise from the FRONT as there was from the back, because the prop noise and intake noise were becoming the longer poles in the tent. In the design in the sketch above I would expect that the holes pointing directly at the side-wall will just make the sound pass straight through the sides. 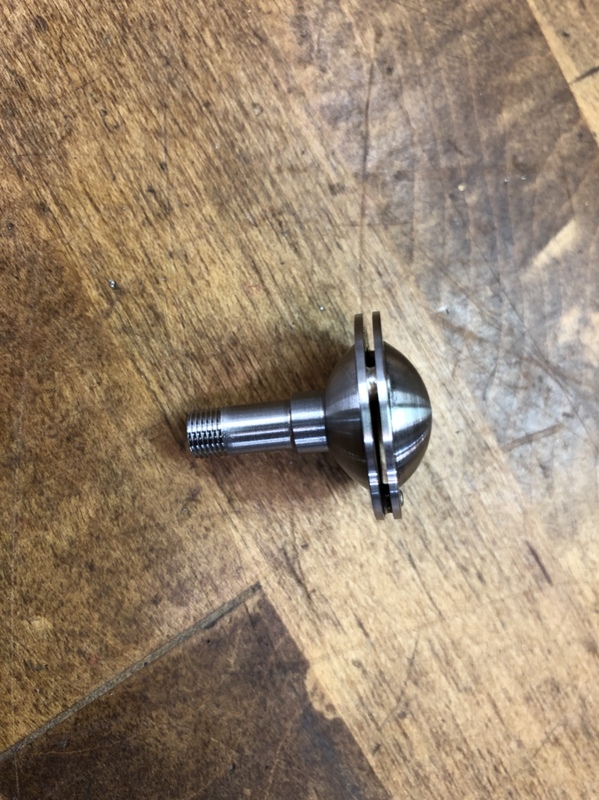 There doesn't seem to be enough volume in the expansion chambers and the outercasing would need to be quite thick-walled to keep the sound inside. Attenuation isn't about restricting gas flow - it's aboput expanding and cooling the gases to take the energy out. If you want it to be REALLY quiet the fil a turbocharger(!) or a pressure-wave supercharger (aka "tuned pipe") because that extracts the same energyu to do useful work. Went to bed last night and thought--and thought--With a bit of redesign I can make the two purple colored pipes identical. This also introduces another set of baffles ahead of the outlet, and gets holes down close to the bottom where any trapped oil can flow into the exhaust tube to be expelled. Bad Behavior has blocked 16533 access attempts in the last 7 days.